Reflection Bay Golf Course is not only beautifully designed and landscaped but this elite pro course brings new meaning to the term, relaxation. It's a perfect getaway from the hectic day to day life. 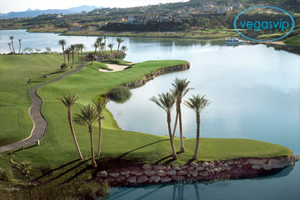 If you love the sport, or merely, just looking for fun and enjoyment, Reflection Bay Golf Course will not disappoint. The golfing experience is not just unique, but extremely affordable with packages starting as low as $65 and includes dining if your group consists of 50 people or more. Typically, when one see's a tropical oasis stretching out amongst the desert, it is regarded as nothing more than a mirage. The sight of flowing water, shade from the palm trees, and plush grass to rest on are all fabrications of what you want to see. Sometimes though, you'll stare long and hard and that mirage won't evaporate. If that mirage remains in tact, you're not crazy – chances are you're standing amidst the Reflection Bay Golf Course in Henderson's Lake Las Vegas. Lake Las Vegas is a secluded section of the city of Henderson built off of Lake Mead Boulevard. A selection of housing and resort hotels tower over a small village reminiscent of a lake-side Charles Dicken's setting. At its roots, Lake Las Vegas is a community – and these days every community needs its own golf course. The Reflection Bay Golf Course was designed by PGA pro Jack Nicklaus, and opened its doors in 1998 to satisfy this unwritten requirement. Reflection Bay stands as Nevada's first ever public golf course designed by acclaimed course designer and pro golfer, Jack Nicklaus. Working with the natural contours of the desert land, Nicklaus shaped this 18-hole paradise to offer the best experience while allowing for indescribable views of the large community of Lake Las Vegas. With five holes bordering the Lake Las Vegas shoreline, guests are sure to feel less like they're in the very tan desert and more like they're amidst a tropical resort. 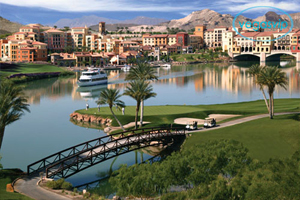 While Reflection Bay may not have the clubhouse to match some of Vegas' other courses, its centralized location in Lake Las Vegas allows for effortless access to the nearby Casino MonteLago and to the string of small shops and eateries in the Lake Las Vegas village. Pricing for the use of Reflection Bay's facilities is unmatchable and should work for all budget-conscious golfers. Amongst its offerings, Reflections is home to its own practice facilities and The Golf Institute training program, headed by the club's own on-site golf pro. Club rentals are available for out of town visitors not willing to lug their equipment on their travels. Cart's are also made available to guests and are included in the day's green fee. Annually, Reflection Bay is used as the tee-off location for Wendy's Three-Tour Challenge, which benefits the Dave Thomas Foundation for Adoption. For individuals hoping to catch a glimpse of some of the PGA's biggest celebrities may be surprised by the appearance of PGA Tour pro Craig Barlow and LPGA pro Natalie Gulbis, as both use Reflections as their home course. Open year round, Reflection Bay offers the best of golfing without coming off as pretentious. While the lack of a centralized club house that offers more elegant amenities may seem like a step in the wrong direction, the simplicity and close-knit community of Reflection Bay makes it a worth-while stop for any Nevada-bound golfer.